Background: Substance P and CGRP are neuropeptides that belong to the thachykinin and calcitonin family, respectively. They play an important role in neuropathic pain development and regulation. Methods: In this study, simultaneous analysis of Substance P and CGRP in rat brainstem tissue was conducted by using LC-ESI-MS/MS method. A gradient mobile phase was used with a Zorbax C8 150x2.1 mm, a particle size of 3.5 µm narrow-bore column. Mobile phases consist of 0.2% formic acid in water (A) and 0.2% formic acid in acetonitrile (v/v) (B). Firstly, mass spectrometry parameters were optimized. 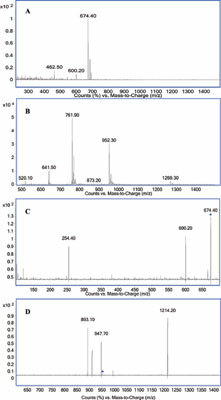 After achieving chromatographic separation, the method has been validated and applied to rat brainstem samples. Results: SP and CGRP were eluted at 8.7 min and 10.1 min, respectively. Mass spectrum of neuropeptides was obtained in positive polarity and ion transitions of Substance P and CGRP were monitored at m/z 674.4→[600+254.4] and 952.2→1214.200, respectively. Linearity range for quantification was 5.85-438.52 ng/mL for Substance P and 0.21-155.28 ng/mL for CGRP. The limit of quantification was 5.85 ng/mL for Substance P and 0.21 ng/mL for CGRP. According to tissue samples analysis (n=6), basal endogen concentrations of Substance P and CGRP in brainstem tissue were calculated as 260.57±11.24 ng/g and 22.53±0.75 ng/g respectively. Conclusion: A novel LC-ESI-MS/MS method was successfully developed and validated according to the bioanalytical validation guideline published by the EMA including precision, accuracy, specificity and linearity. Acceptable results were achieved. Basal endogen concentrations of Substance P and CGRP in brainstem tissue were determined. Substance P, CGRP, LC-ESI-MS/MS, rat brainstem tissue, neuropeptide, determination.